All Hilltown homes currently listed for sale in Hilltown as of 04/21/2019 are shown below. You can change the search criteria at any time by pressing the 'Change Search' button below. If you have any questions or you would like more information about any Hilltown homes for sale or other Hilltown real estate, please contact us and one of our knowledgeable Hilltown REALTORS® would be pleased to assist you. "Only 2 lots left in this prestigious community of Galway Farm Estates. Build your dream home on this picturesque 4+ acre lot. The Connamar Model is one of the many floor plans to choose from. As grand in scale as it is meticulously crafted. This stunning model offers 5 bedrooms, 4 full bathrooms, 2 powder rooms and a 3 car garage. There are 10 ft ceilings on the 1st floor, 9 ft ceilings on the 2nd floor, as well as a grand, front to back, foyer with a custom oak staircase that greets you as you enter. There is a 2nd foyer for everyday use along with a back staircase. A gourmet kitchen is a must with an open breakfast room and butler's pantry. Fireplaces located in family room and living room. Meet the builders to explore further options and customizations. An excellent location just minutes to Peace Valley Park, Doylestown, Lake Nockamixon and so much more. (Photos are of previously built homes by Cork County Homes in Bucks and Montgomery Counties.) Geothermal heating is an option!" "Cork County Homes is offering this popular Adare floor plan, with over 4300 sq ft of living space, on a picturesque 3.90 acre lot at Galway Farm Estates. This hidden gem of Hilltown Township is just a short 4 minutes to Lake Galena in Peace Valley Park and Doylestown. Breaking ground in April so there is still time to pick your options and customize. The flexible floor plan has a beautiful 2 story entrance, 9' ceilings throughout 1st floor, oak staircases, gourmet eat-in kitchen with 42 cabinets, granite countertops, kitchen island, pantry, double oven and more. Open family room with gas fireplace, study with glass doors, large mudroom and 2 powder rooms on main floor. The 2nd level offers an owner's suite that feels like a getaway with large walk-in closet(s), sitting room and luxurious owner's bathroom. An upstairs laundry room, 3 additional bedrooms and 2 additional full bathrooms complete the 2nd floor. Many possibilities in the walk-out lower level with daylight windows and 9 foot ceilings. Optional conservatory, in-law suite, 5th bedroom and walk-up attic. Homes built with the highest quality workmanship, amenities and attention to detail. (Photos shown of previous Adare models built by Cork County Homes.)" "Welcome to Peppermint Farm, selected as the 44th Bucks County Designer House! The quintessential Bucks County farmstead with a charming circa 1860 farmhouse that has been expanded over the years and is about to be transformed by a team of designers. The property offers multiple outbuildings on 30 gorgeous acres pastoral views, open fields, woods and a stream. A truly tranquil setting! Whether you're an equestrian, outdoorsmen, organic farmer, a builder or just simply looking for a country retreat. The possibilities are endless. The home boasts many period details throughout such as random width floors, deep curved window sills, exposed beams, stone floors, two covered porches and more! Enter the home from a lovely covered porch through a Dutch door into a spacious, sunlit foyer with stone floors and wood paneling. Just off the foyer is a home office with a walk-in fire place that was formerly the smoke house. Stay organized with cubbies located in the foyer area. Just past the foyer is an expansive family room with flagstone floors, high ceilings with exposed beams, beautiful wood paneling, built-ins, a window bench with storage and wonderful natural light. The eat-in kitchen leads to a formal dining room with access to the covered front porch from the original front door of the home. The dining room flows into the formal living room. Both the dining and living rooms have gorgeous random width floors, deep sills and built-ins. The first floor also offers a powder room, a laundry room and a mudroom/dog grooming room with outdoor access. Upstairs offers a master bedroom suite with a private bathroom and a large closet with custom built-ins. There are 5 additional spacious bedrooms with ample closet space, 2 full bathrooms, 1 half bathroom, multiple hall closets and storage, including a cedar closet. Walk-up staircase to the 3rd floor attic space. The garage offers 2-car parking with electric garage doors, walk-up storage above and an attached workshop with elec"
"Welcome to Peppermint Farm! Selected as the 44th Bucks County Designer House! The quintessential Bucks County farmstead with a charming circa 1860 farmhouse that has been expanded over the years and is about to be transformed by a team of designers. The property offers multiple outbuildings on 30+ gorgeous acres pastoral views, open fields, woods and a stream. A truly tranquil setting! Whether you're an equestrian, outdoorsmen, organic farmer, a builder or just simply looking for a country retreat. The possibilities are endless. The home boasts many period details throughout such as random width floors, deep curved window sills, exposed beams, stone floors, two covered porches and more! Enter the home from a lovely covered porch through a Dutch door into a spacious, sunlit foyer with stone floors and wood paneling. Just off the foyer is a home office with a walk-in fire place that was formerly the smoke house. Stay organized with cubbies located in the foyer area. Just past the foyer is an expansive family room with flagstone floors, high ceilings with exposed beams, beautiful wood paneling, built-ins, a window bench with storage and wonderful natural light. The eat-in kitchen leads to a formal dining room with access to the covered front porch from the original front door of the home. The dining room flows into the formal living room. Both the dining and living rooms have gorgeous random width floors, deep sills and built-ins. The first floor also offers a powder room, a laundry room and a mudroom/dog grooming room with outdoor access. Upstairs offers a master bedroom suite with a private bathroom and a large closet with custom built-ins. There are 5 additional spacious bedrooms with ample closet space, 2 full bathrooms, 1 half bathroom, multiple hall closets and storage, including a cedar closet. Walk-up staircase to the 3rd floor attic space. 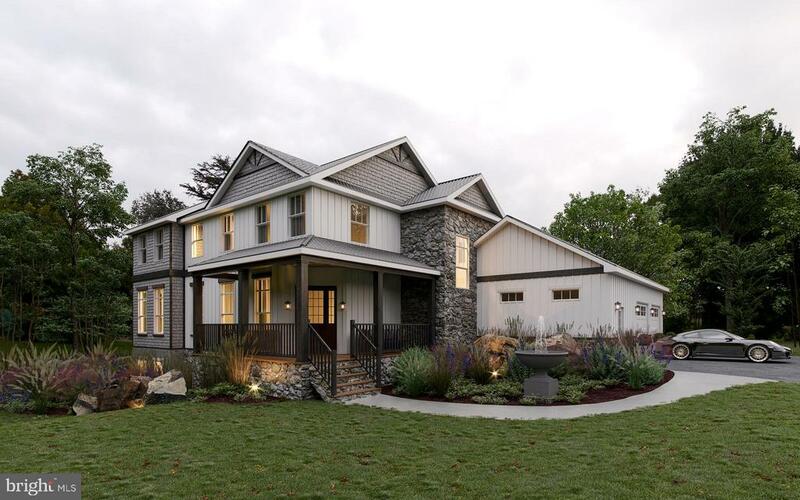 The garage offers 2-car parking with electric garage doors, walk-up storage above and an attached workshop with el"
"Casadonti Homes will design and build to suite Refined Farmhouse Style custom new home with barn-wood details in this unique setting. Existing silo can also stay in place and can be incorporated in the rear patio design, if Client desires. L/A will set appointment to see Lot and meet with Designer/Builder." "Gorgeous custom Home in Hilltown Twp is awaiting your arrival. This stunning colonial is situated on 1.7 acres of open land plus an amazing open floor plan. Once you enter into the 2-story Foyer with a huge second level window, you'll see the space & brightness this home eludes. The open Foyer is flanked by formal Living (currently being used as a game room) & Dining Rooms, both with neutral d?cor, and ceramic tile flooring. The Kitchen boasts oak cabinetry, with neutral Corian countertops, island seating, recessed lighting, plus a newer stainless refrigerator, highlighted with luxurious hardwood floors. This eat-in kitchen has plenty of space for entertaining and opens to the spacious Family Room with vaulted ceilings, and a marble gas fireplace. The Cozy Office with french doors, Laundry Room & Powder Room complete the Main Level. Upstairs, an impressive Main Bedroom is provided, with coffered ceiling, a sitting room area, dressing room, walk-in closet, and an unfinished walk-in a partially floored attic. In addition, there is an en-suite Bath with a soaking tub, separate shower & dual vanities. 3 additional Bedrooms share the neutral Hall Bathroom with neutral ceramic tile. The finished Lower Level encompasses an additional sq ft of potential living space complete with a 2nd kitchen, a 2nd family room, 2 additional bedrooms, storage room, and steps that lead to the outside. There is a 3 car garage, with plenty of driveway parking. The backyard has a large patio deck, with ample space for numerous entertaining areas. This premium location & unique open layout will have you yearning to come here every day!"